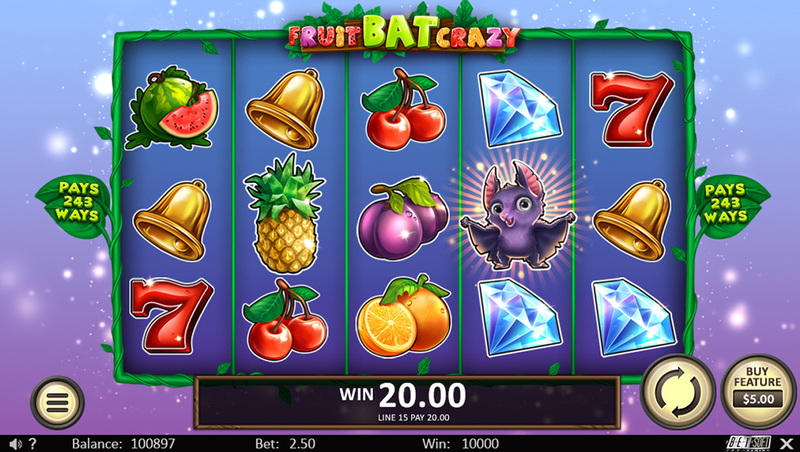 Overview: Fruitbat Crazy is a 5 Reel All-Ways-Pays Video Slot with a Buy Feature Discount, A Free Spins Feature, Wild Symbols, and a Double or Nothing Minigame. Fruitbat Crazy stars a cheeky bat who’s always on the prowl for food. In Fruitbat Crazy, clusters of low-value symbols always pop first, allowing higher-paying stacks to mount up before splattering them in one big explosion. Unlike other cascading slots, Fruitbat Crazy’s roster of symbols also collapses on a combo-by-combo basis, with smaller wins resolving before triggering their own collapses – creating the chance for some seriously succulent payouts. 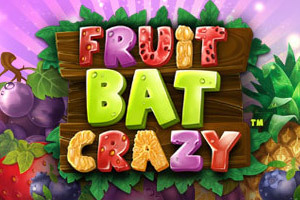 Beyond the 3X5, 243 ways to win the base game, Fruitbat Crazy earns its name in the free spins feature: find 3 or more Fruitbat symbols and a whole flock will descend from the trees and gorge themselves over the course of 10 or more free spins. Unlike traditional cascading games, low-paying combinations always resolve first and generate their own collapses, improving the chances of big wins. Find 3 or more scatter symbols and bats will gorge themselves on an avalanche of fruit over 10 or more free spins. Appearing on even-numbered reels, these glinting gems can stand in for any symbol from the fruit stand. During play, BONUS BUY COIN symbols will appear on the reels. Each BONUS BUY COIN collected will reduce the cost of the Buy Feature. Once the Buy Feature reaches a cost of 0.00, it will automatically trigger! The BONUS BUY discount is remembered between play sessions.